This product definitely gets Jeremy Gay's vote - and not just for the sheer simplicity of the lid on the bucket! Hoorah! A salt bucket that I can open without breaking my fingers! Yes Aquavitro Salinity marine salt from Seachem comes with a lid that you actually unscrew and then can screw back up again. This is so easy to do and mind-blowingly simple that competitors must take note! I’ve got my eye on that bucket for other fishkeeping duties when it empties too! A few other things also add to the difference and I really rate this product. Firstly, it’s incredibly concentrate and Seachem actually claims it’s the most concentrate on the market. This means that my 15.7kg bucket will make 450 l/99 gal of full strength seawater. Secondly it’s got the parameters I want from seawater and that means good pH, calcium, magnesium, KH, strontium and potassium — but not too much. Several salts I’ve used of late have given me off-the-scale magnesium levels at 1,500+, but then when I lower the specific gravity to compensate my KH and calcium go too low. Until recently I’d been experimenting with lower salinity salt recipes for SPS corals, running my tank at 33ppt instead of 35. The result wasn’t good and I could never get a potassium or strontium reading from them, so when I got some Aquavitro Salinity I went up to recommended salinity, my parameters all became what I wanted and my corals showed me polyps which they hadn’t shown for a long time — and growth. You know when you get a funny reading from a test kit and it makes you paranoid — so you get another test kit, then a third, and none match up? Aquavitro Salinity has a label on each bucket detailing guaranteed analysis, so you get peace of mind that what you’re putting in is of the right levels. 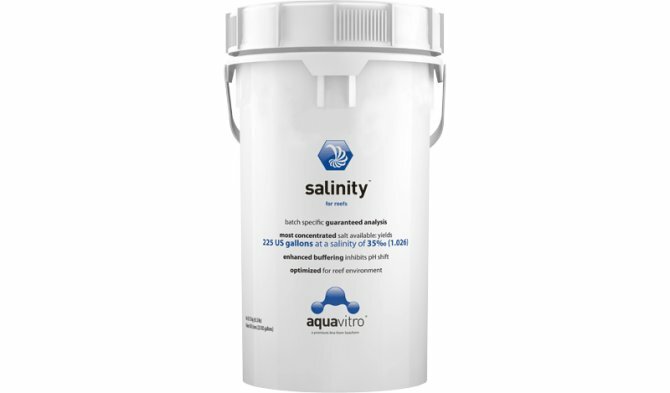 The only downside with Aquavitro Salinity is that you can’t buy it online, but that’s a good thing for bricks and mortar retailers. I went to the dealer locator on the Seachem site and it turned out that my local store stocks it anyway, so all was good. Salinity and other Seachem products are now part of a dealership scheme and only sold by independent, bricks and mortar aquatic stores. Of all the salts I’ve tried of late I was pleasantly surprised with this one. Its guaranteed parameters meant I could improve my own and I saw positive results. The lid, the stats and the fact that I could buy it from local shops means that this product definitely gets my vote and recommendation. Price: 15.7kg £69.99; 29.8kg £99.99. Alf Ltd is the UK wholesale distributor.